El Jaguar is proud to be part of Little Andromeda 2018! It's been a challenging 8 years but the city has come a long way; and we should celebrate! 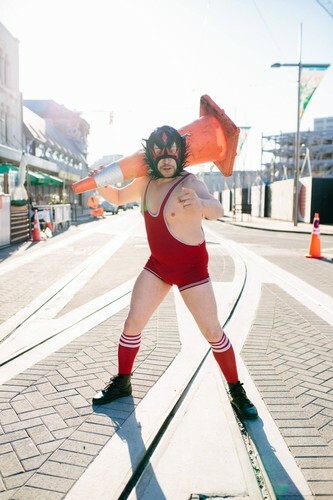 Join Buskers Fest favourite, El Jaguar, for a hilarious alternative bus tour/fiesta celebration, to visit the emerging city first hand. From bus sheds to playgrounds, from galleries of art to strange lanes, (and a beautiful brand new central library!) El Jaguar shares his outlandish outsider’s view on the city being built right before our very eyes, complete with some “alternative facts”. If it's been awhile since you've been within the four avenues or you spend all your time cruising Cashel, this tour will have a unique perspective on life in this new garden city. Even if you are new to the city or just visiting, this tour will be an experience not to be missed. Climb aboard amigos! Let’s celebrate Christchurch and the some of the folks who make it awesome. Bus leaving from Little Andromeda. Group bookings available. Recommended for kids aged 10 years or older with a guardian.